The British comedy series Blackadder is indeed one of the most acclaimed and beloved shows to have emerged from the United Kingdom; with its excellent, witty and purely fun scripts from Richard Curtis and Ben Elton, to its formidable star making lead performances particularly from the great Rowan Atkinson, and its satirical commentary on English history, the series is a real jewel in the catalogue of intellectual humour. Each season (or series) was set in a different period of history, but still season 4 caught audiences a bit off guard. The setting would be a British trench in 1917 at the height of the First World War (1914-1918). A sitcom set in a war zone? Though other shows like Hogan’s Heroes and M*A*S*H* did find critical and commercial success, feelings of apprehension would always remain around these sensitive subjects. But Blackadder Goes Forth approached its subject matter not only with wonderful satire but with great commentary on the absurdity of armed conflict. The show never mocked the soldiers, medical personnel, victims or others affected, choosing to use its satirical bow and arrow on the men in charge. Its lampooning of Generals and other higher ups reaffirmed the notion that the soldiers were really “lions led by lambs”. Though the whole season provided great laughs and clever critiques, it is the final episode Goodbyeee that remains one of the most emotionally poignant half of hours in television history, especially its final scene. 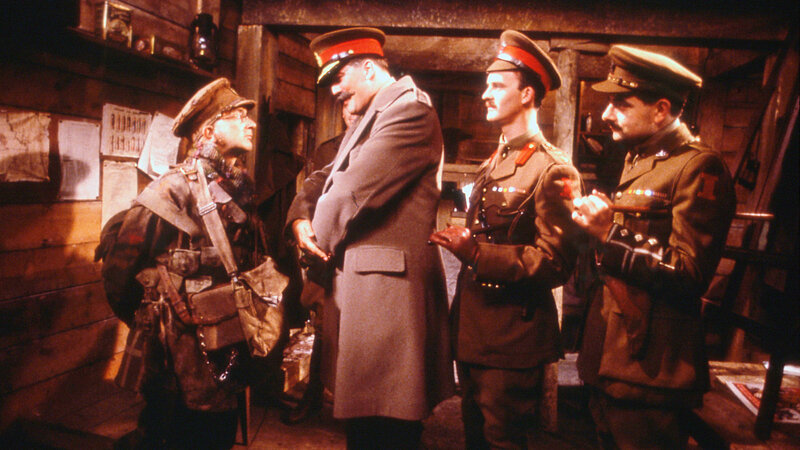 Captain Edmund Blackadder (Rowan Atkinson) spent the entire series trying to find ways to be sent out of the trench and avoid “going over the top”. In a last ditch effort he pretends to have gone mad by putting a pair of underpants on his head and sticking two pencils up his nose while muttering gibberish. The plan ultimately fails and our characters must now face the proverbial music, straight into almost certain death. For a series largely comically written, the genius of “Blackadder Goes Forth” was its ability to meld its humour with very incisive bits on the meaning of war, the ineptitude of the commanders, and the colossal waste of life. There is a sense of great foreboding throughout the final episode particularly as we move ever closer to the ending. Suddenly the comedy ceases and there comes a realization that despite all the comic masking there can be no sugar-coating the hideous reality about to face these characters we have grown to care about. Atkinson stated that he felt a knot in his stomach in the week leading up the episode’s filming, knowing that his and co-stars characters were going to die. As time and options have run out for Captain Blackadder, Lieutenant George (Hugh Laurie), Private Baldrick (Tony Robinson) and Captain Darling (Tim McInnerny) along with others, Blackadder Goes Forth ends in a most extraordinary way. These protagonists were now not just satirical creations but humans with genuine feelings of fear and uncertainty, facing the unknown with great bravery. Statistics of casualties in any war may not always be moving because we often don’t know the names of those killed, but here the series brought the truth home. Those who have died could have been any one of us; your neighbor, friend, father, brother, sister etc. And so our characters prepare to go over the top but before the whistle blows Captain Blackadder so tragically and eloquently leaves us with “Who would have noticed another mad-man around here? Good luck everyone.” With that they charge the enemy as the series’ theme is played melancholically on piano before fading into a field of poppies. It is truly one of the saddest and emotionally rewarding finishes to a television series, and proof to skeptics that the producers/writers had their hearts in the right place. 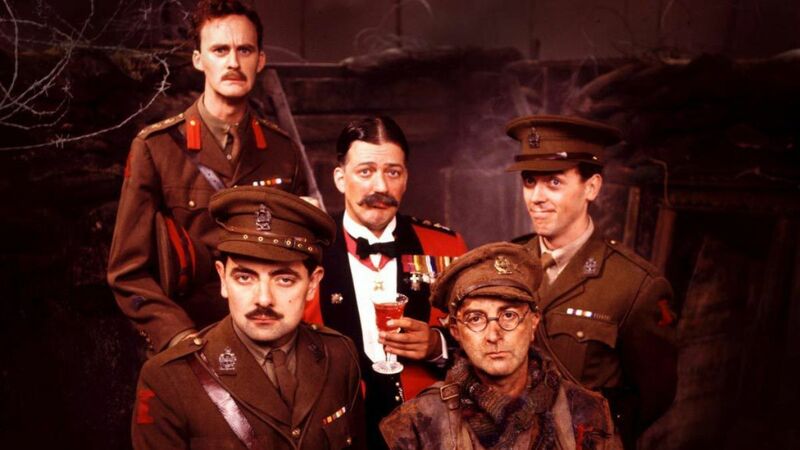 Blackadder in its entirety was a masterclass, yet Blackadder Goes Forth and its final episode were amongst the most comically and emotionally poignant of all. This combination of feelings is a showcase of great brilliance. As another November 11th approaches, we must once again utter the phrase “Lest we Forget”; but not just on that day but every day. Thankfully through numerous works of art like Blackadder we are aided in our mission to commemorate those senselessly lost in the futility of all global conflict. STIRRING AND BEAUTIFUL TECHNICAL WORK HIGHLIGHT “DUNKIRK”, WHILE LACK OF EMOTIONAL APPEAL DRAGS IT DOWN. Avengers: Infinity War is dubbed “the most ambitious crossover event of all time” on the surface but feels far more pedestrian when examined closer. In celebration of the 10th anniversary of the critical flop turned cult classic - Speed Racer - we asked the staff: What is your favorite critical flop?